The American Association of Airport Executives (AAAE) filed comments on behalf of its membership in response to the FAA's Supplemental Notice of Proposed Rulemaking on Safety Management Systems (found here: FAA-2010-0997). To view the full text of AAAE's comments, please click here. The Firm assisted AAAE and many airport sponsors in preparation of comments on this important proposed rule. As detailed in the AAAE's July 12 alert on the release of the SNPRM, the industry had waited six years for this revision to the original Notice of Proposed Rulemaking (NPRM) published in October 2010. 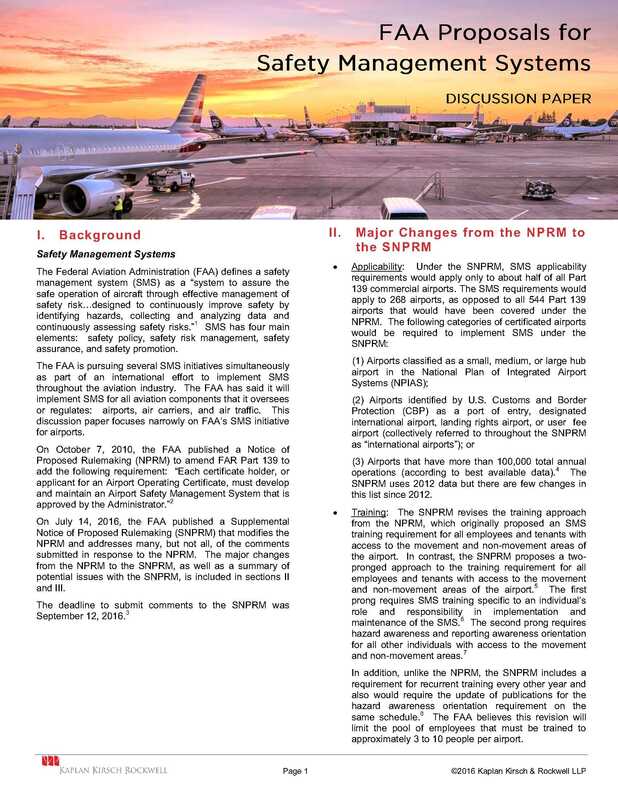 The original NPRM proposed to amend FAR Part 139 to add the requirement that "each certificate holder, or applicant for an Airport Operating Certificate, must develop and maintain an Airport Safety Management System that is approved by the Administrator." The Firm has prepared an outline of the provisions of the SNPRM. Please click here to view our white paper.